Hello! 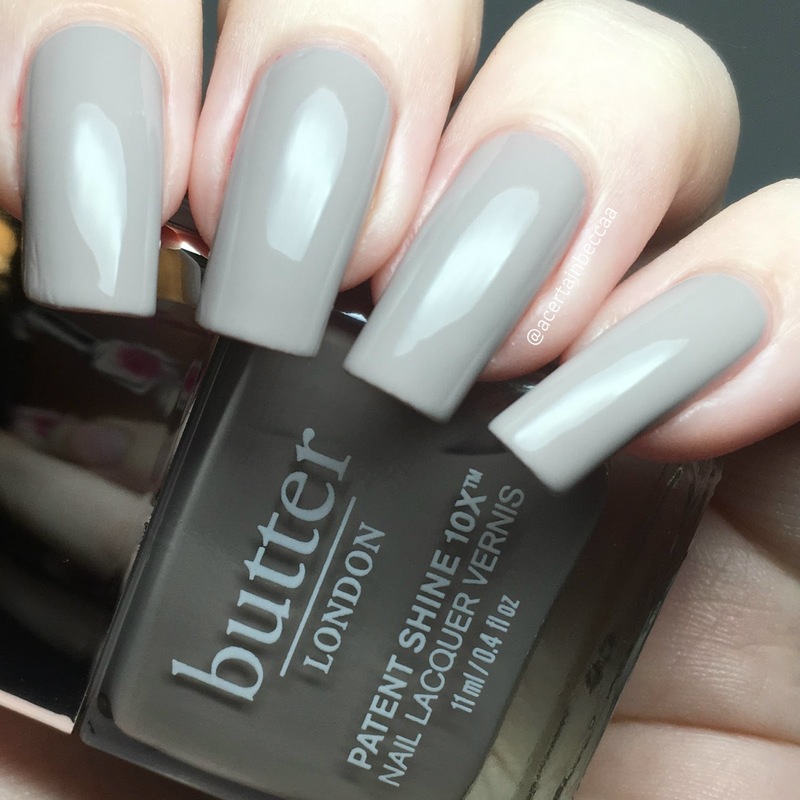 Today I have swatches of two of Butter London's Patent Shine polishes. I don't own many Butter Londons, so when I was offered the chance to review a couple, of course I said yes! 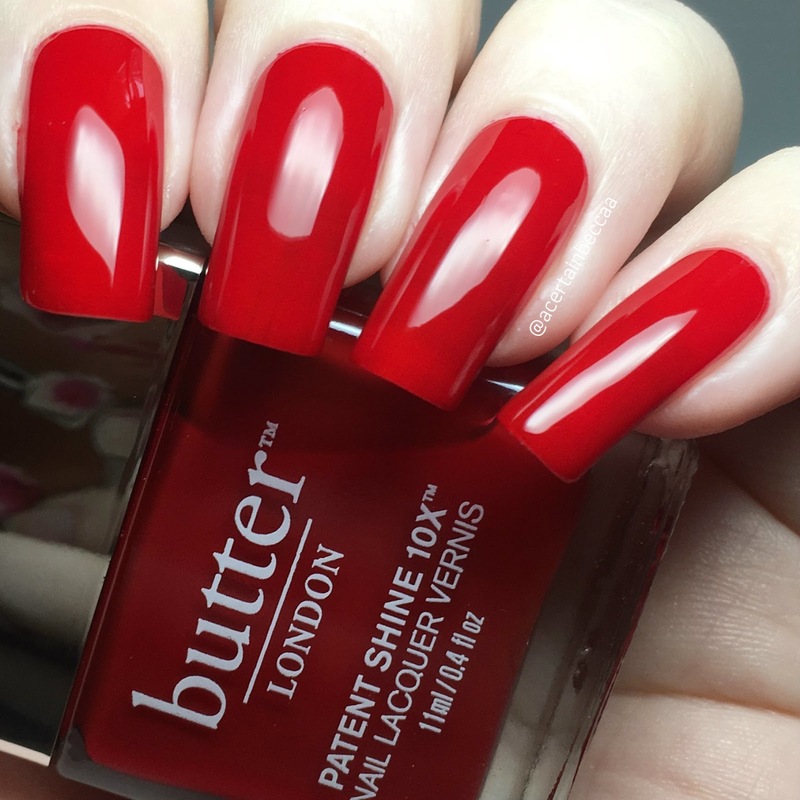 The Patent Shine line claims to be 'the first 10-in-1 nail lacquer made with Patented Shock Resisting Polymer Technology', with both a gel-like wear/finish and a nail strengthening formula. Read on for my full swatches of 'Her Majesty's Red' and 'Ta-Ta!' and some quick stamping. 'Her Majesty's Red' is a classic, rich red creme. As with a lot of reds, this does start off on the sheer side, though it has a lovely formula and applies very smoothly and easily. I still had visible nail line after a second coat, so added a third. Those with shorter nails or softer nail lines should be fine in two. Below is three coats with topcoat. 'Ta-Ta!' is a grey creme. The formula is smooth and easy to apply. This is the more opaque polish of the two. I had a couple of minor streaks on my second coat, but these were easily covered with a quick third coat. Again, those with shorter nails could most likely get away with just the two. Below is three coats with topcoat. As the two colours pair together so nicely, I decided to use them together in a quick mani. 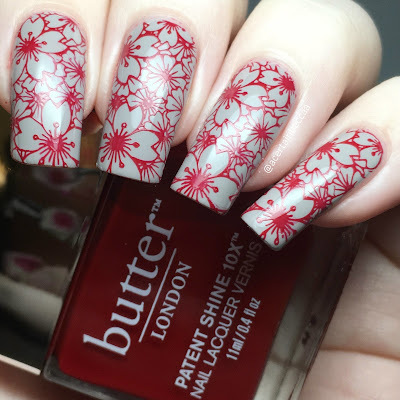 I was pleasantly surprised to find that 'Her Majesty's Red' stamped perfectly. Using the floral pattern Creative Shop stamping plate 85, I stamped over a base of 'Ta-Ta!'. What do you think? Both colours are classic essential shades for any polish lovers collection, and I do love them together. True to their claims, they dried down to a glossy, gel-like finish. Unfortunately, I didn't wear them long enough to test the wear time - although I have never had problems with Butter London in the past! 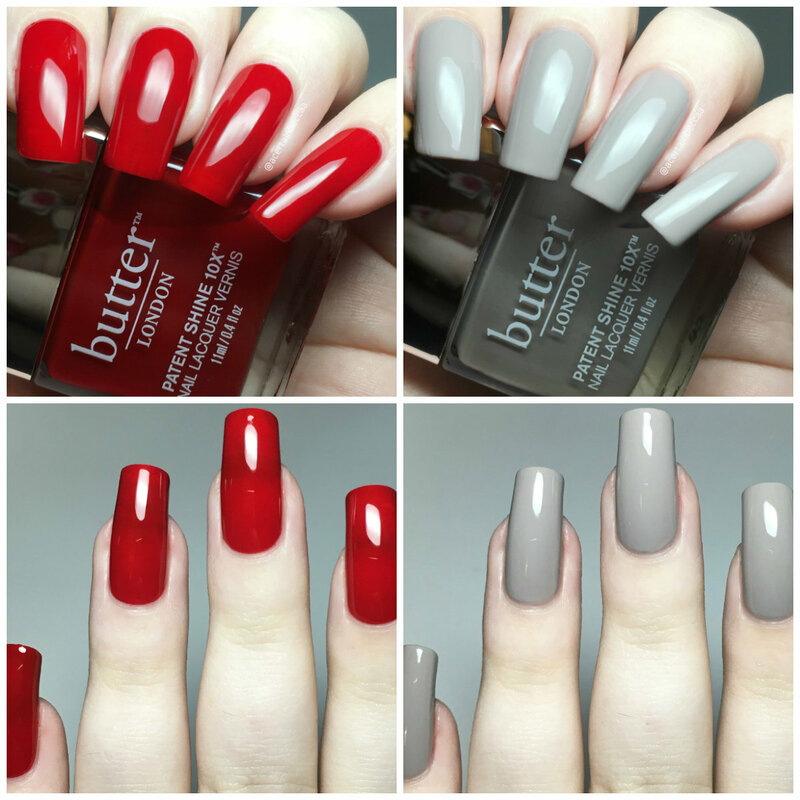 The Butter London website is currently going through a makeover, but you can find both polishes mentioned along with many more on the Feel Unique website here. Labels: Butter London, Creative Shop, Grey, Her Majesty's Red, Nail Art, Patent Shine, Press Sample, Red, Stamping, Ta-Ta, Ta-Ta!